The North America wheelchair accessible vehicle converters market has been displaying significant growth rate over the last few years, thanks to the increasing number of patients with disability. In the years to come, the market is likely to gain substantially from the rising demand for user-friendly accessible vehicles and the surge in the launch of affordable mobility gadgets. Apart from this, the mounting number of trauma cases, leading to disability and the escalating geriatric population is also expected to provide lucrative growth opportunities for the wheelchair accessible vehicle manufacturers in the near future. In 2015, the North America market for wheelchair accessible vehicle converters was worth US$1.74 bn. According to researchers, the market’s future looks bright, rising at a CAGR of 5.30% from 2016 to 2024 and reaching US$3.47 bn by the end of 2024. On the basis of the type of vehicle, the North America market for wheelchair accessible vehicle converters has been classified into three broad categories, i.e., full size vehicles, medium size vehicles, and small size vehicles. Full size vehicles have been leading this market in terms of revenue; however, the demand for medium size vehicle is higher in North America. In 2015, the full size vehicle segment accounted for more than 48% of the overall market. With the increasing uptake of wheelchair accessible vehicles as family cars among families with disabled people, the revenue generated from this segment is likely to augment in the near future, ensuring its lead. Based on the entry modality, the market has been categorized into ramps and lifts. The demand for ramps, which are mainly used for the medium size and small size vehicles, has been higher than lifts, which mostly find utilization in the case of a full size vehicle. The relatively low installation and maintenance costs of ramps have kept them a step ahead of lifts. The ramps segment led the North America wheelchair accessible vehicle converters market in 2015 with a share of 48.1%. Thanks to the ease of usage, ramps are expected to remain high in demand in this region over the next few years. In terms of geography, the market for wheelchair accessible vehicle converters in North America has been segmented into the U.S. and Canada. With a share of nearly 95%, the U.S. led the overall market in 2015. The scenario is expected to remain so over the next few years, thanks to the presence of a large base of disabled population. The rising adoption of wheelchair accessible vehicles, stimulated by the increasing number of awareness initiatives by the manufacturers of vehicle converters, increasing cases of trauma resulting in disability, and the surge in the government funding for wheelchair accessible vehicles are also projected to boost the U.S. market for wheelchair accessible vehicle converters in the years to come. The North America market for wheelchair accessible vehicle converters is fragmented and highly competitive in nature. Mobility Ventures LLC, Vantage Mobility International, and BraunAbility are at the forefront of this market. Some of the other prominent vendors of wheelchair accessible vehicle convertibles in this region are Toyota Motor Corp., Rollx Vans, and Freedom Motors USA. This report on the North America wheelchair accessible vehicle converters market analyzes the current and future prospects of the market. It comprises an elaborate executive summary, including a market snapshot that provides overall information of various segments and sub-segments. It is a combination of primary and secondary research. Primary research formed the bulk of our research efforts along with information collected from telephonic interviews and interactions via e-mails. Secondary research involved study of company websites, annual reports, press releases, stock analysis presentations, and various international and national databases. The report provides market size in terms of US$ Mn for each segment for the period from 2014 to 2024, considering the macro and micro environmental factors. 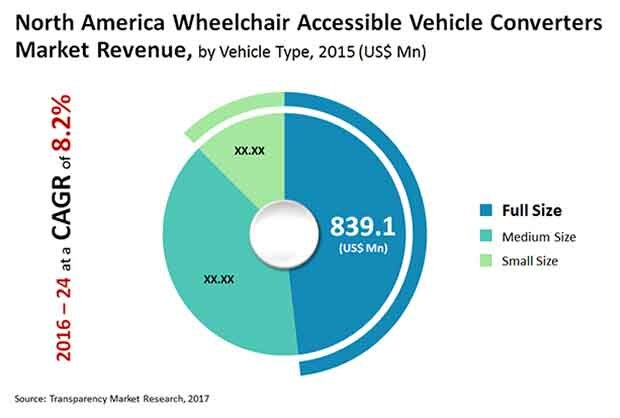 Growth rates for each segment within the North America Wheelchair Accessible Vehicle Converters market have been determined after a thorough analysis of past trends, demographics, future trends, technological developments, and regulatory requirements. A detailed qualitative analysis of factors responsible for driving and restraining market growth and future opportunities has been provided in the market overview section. This section of the report also includes market attractiveness analysis that provides a thorough analysis of the overall competitive scenario in the North America Wheelchair Accessible Vehicle Converters market. Market revenue in terms of US$ Mn for the period between 2014 and 2024 along with the compound annual growth rate (CAGR %) from 2016 to 2024 are provided for all the segments, considering 2015 as the base year. Market size estimations involved in-depth study of services and product features of different types of services. Additionally, market related factors such as increasing preference for technologically advanced services, product innovation, and increasing prevalence of trauma cases and disability cases in North America and historical year-on-year growth have been taken into consideration while estimating the market size. Based on vehicle type, the North America Wheelchair Accessible Vehicle Converters market has been segmented into full size vehicle, medium size vehicle and small size vehicle. The market has been further studied from the point of view of major entry modality. Based on entry modality, the market has been categorized into ramps and lifts. On the basis of entry mode, the market has been segmented into side entry and rear entry. The report also profiles major players in the Wheelchair Accessible Vehicle Converters market based on various attributes such as company overview, financial overview, SWOT analysis, key business strategies, product portfolio, and recent developments. Key companies profiled in the report include Toyota Motor Sales, U.S.A., Inc., BraunAbility, Freedom Motors USA, Vantage Mobility International and Mobility Ventures LLC.